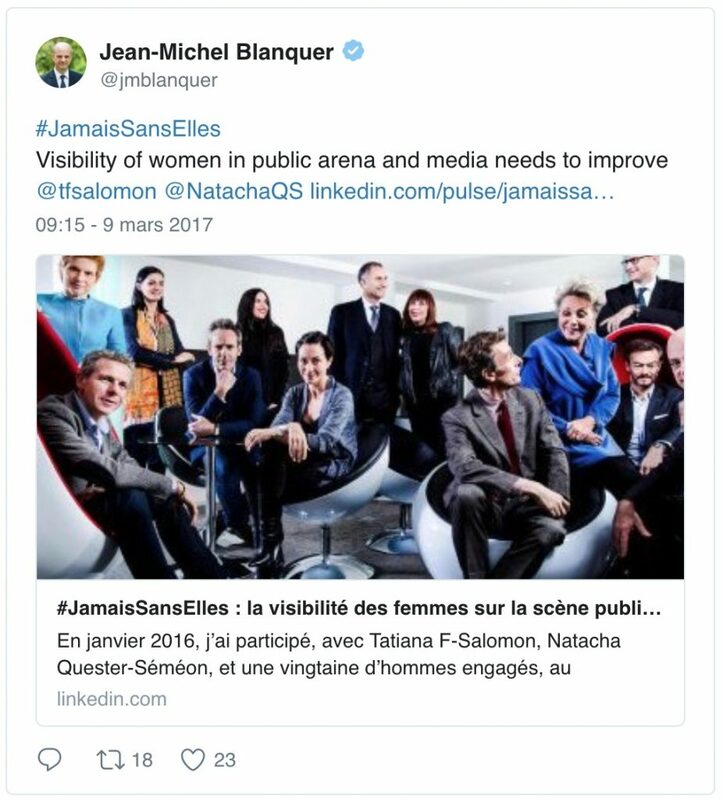 A disruptive concept, a new mode of action, #JamaisSansElles, the movement for the promotion of gender equality, is now unavoidable. In a very short time the hashtag that symbolizes it has become the most shared on Twitter in its category. Here’s a look at some of the highlights since its inception. 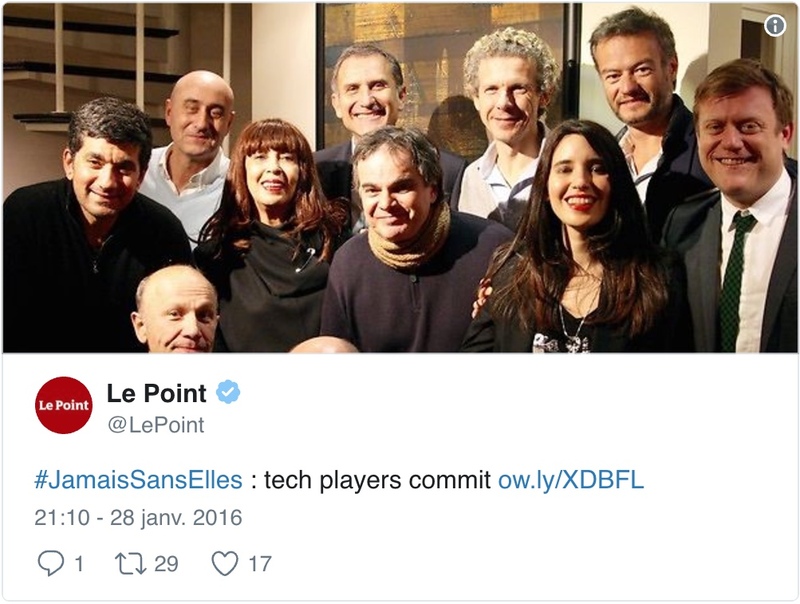 The history of the #JamaisSansElles movement and its impact and penetration on social networks can be seen in the graph below, which represents hashtag activity as a function of time from its creation in January 2016 until October 2017. During this period, the hashtag was associated with 94 000 tweets and retweets, posted by 24,000 contributors and generated 424 million impressions, for a potential total reach of 60 million. What is most striking first of all with regard to the hashtag statistics* is not only the extent of the response to the movement and the great reactivity of the community it has federated but also the consistency and durability of its impact (see history of the hashtag). The main reason for the consistency is that the movement has grown organically on social networks, far removed from any marketing plan and with the support and direct involvement of influencers and leading figures in the economic and political worlds and in voluntary associations in the the country. 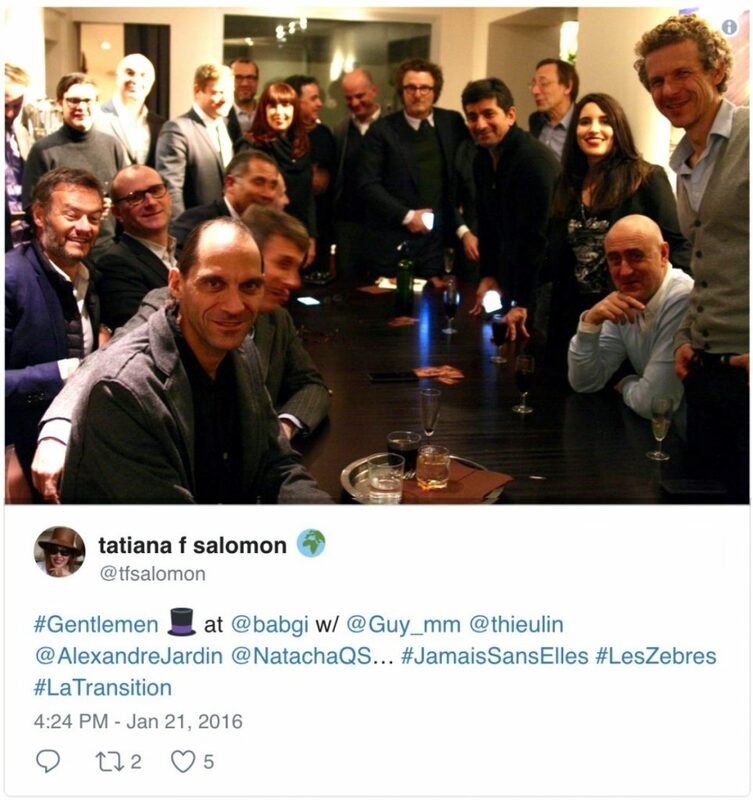 Thus, though the hashtag has largely benefited from the influence of its founders and initial supporters —­ including the members of the Club des Gentlemen, with their 600,000 followers, Girl Power 3.0 (referring community), the #JamaisSansElles Association Women’s Council, totaling 1.2 million followers — it has rapidly become an independent indicator of the fight for diversity and gender equality, and the natural medium for speaking engagements that favor the recognition of the role, legitimacy and presence of women alongside men in all spheres of activity, decision-making and representation. 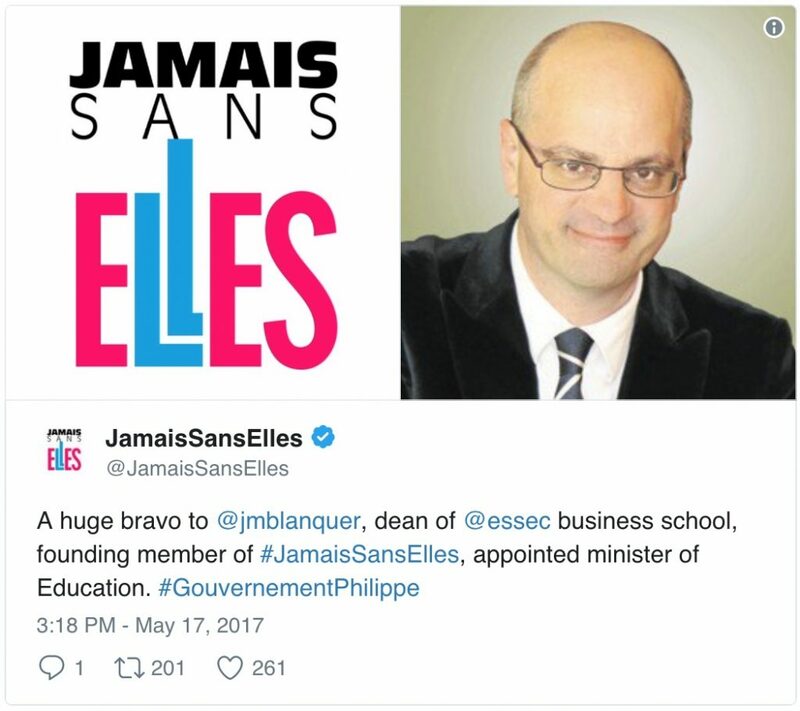 In this way, a qualified community was created to fuel and pass on relevant information and messages, which are also developed in a qualitative and continuous manner by the #JamaisSansElles Twitter account team, whose daily activity ensures that the hashtag’s vitality is constantly renewed. 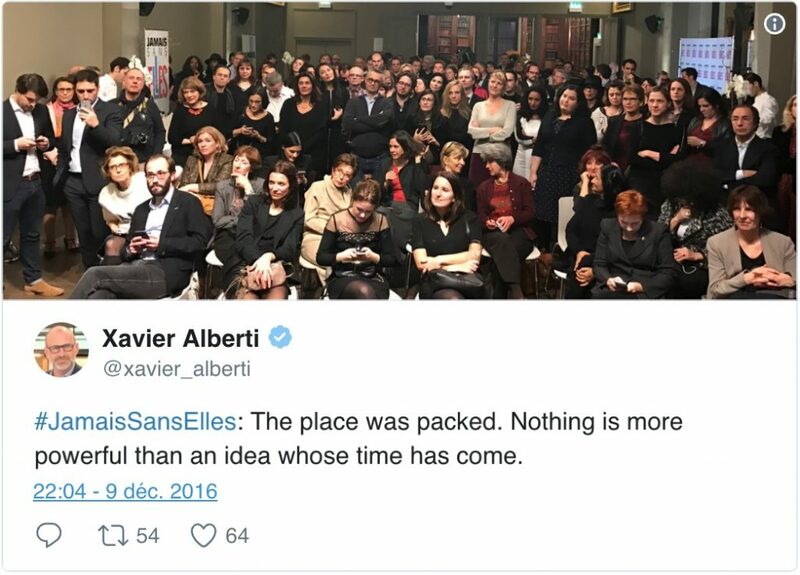 For the second time the hashtag #JamaisSansElles made it into Twitter trending topics (3rd place) during the “Anniversary Soirée” of the movement. 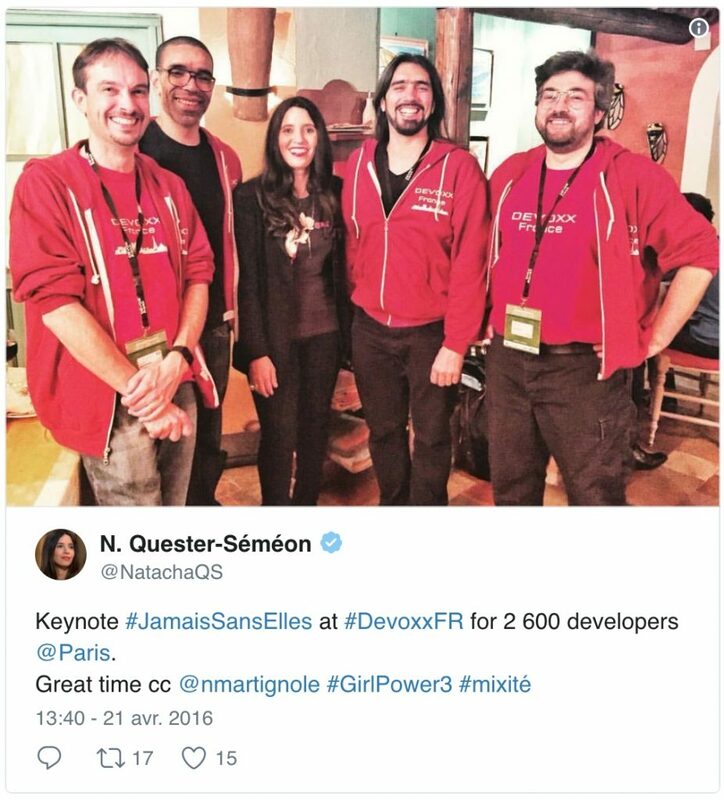 The tweets reflecting the speaking engagments of the Association’s Women’s Council (in particular Laurence Parisot and Nathalie Kosciusko-Morizet) are among the most shared. The corresponding peak of activity is clearly visible on the graph (see above). The participation of many influential supporters contributed greatly. As soon as the new President of the Republic was elected, discussions were held on the application of the #JamaisSansElles Presidential Charter signed by the candidate Macron with the possibility of appointing a female Prime Minister, brought up during the campaign, as well as naming women to key positions in government and ministerial offices. The most important peak of this sequence took place on May 17, 2017 just as the first government of Edouard Philippe was being appointed. 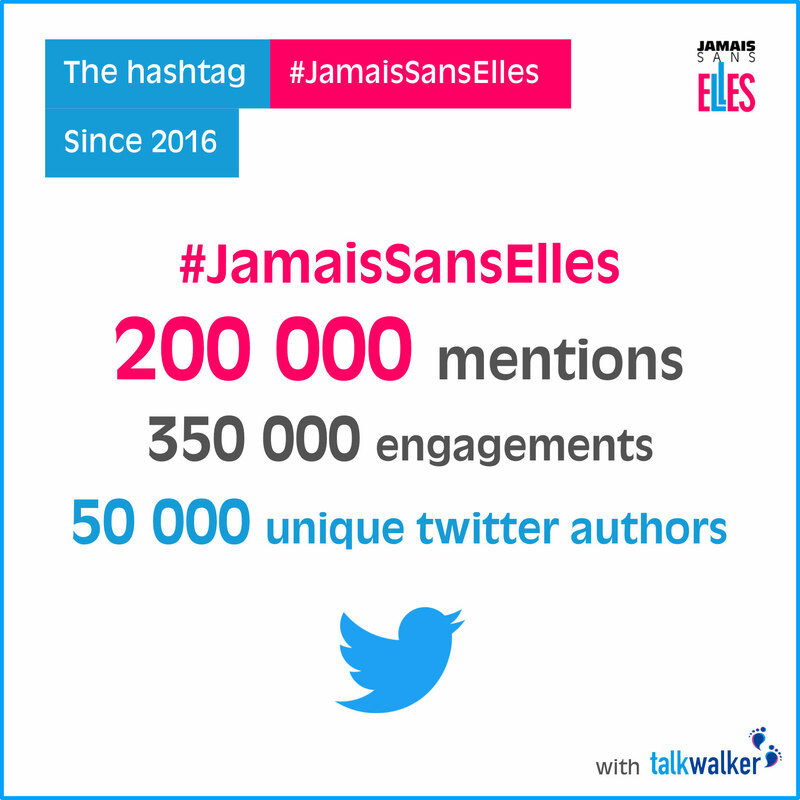 Within hours of the launch of the Appeal, the #JamaisSansElles hashtag rose to Trending Topics on Twitter.The results of the first week of activity are clear evidence of network support, particularly through the number of direct contributors. 4️⃣ Charter #JamaisSansElles for presidential candidates, International Women’s Day (March 7 and 14 March 2017). 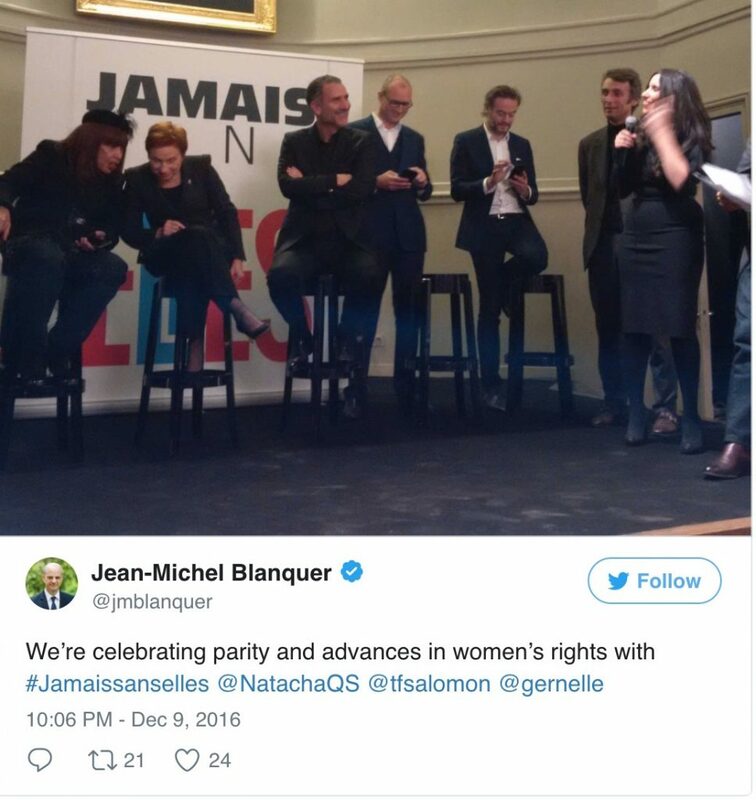 During 2017 presidential elections, #JamaisSansElles proposed a Charter to the candidates on March 8 so they could commit to defending and promoting gender equality at all levels of the public sphere. Two candidates have signed it: Emmanuel Macron and Benoit Hamon. 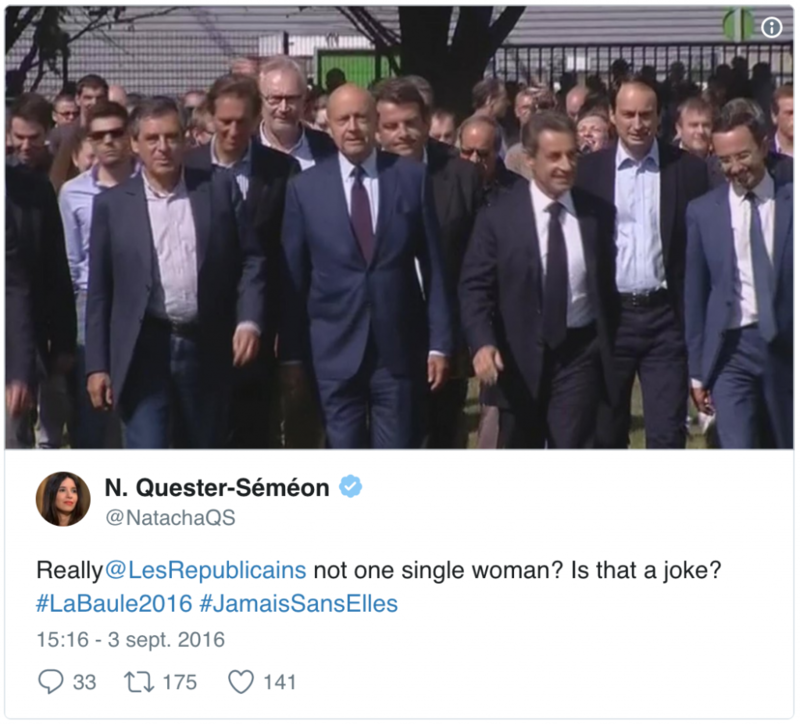 In September 2016, the Republicans prepared the center-right primary; there was only one woman in the race, Nathalie Kosciusko-Morizet, but uncertainty regarding her candidacy focused the attention of the community. 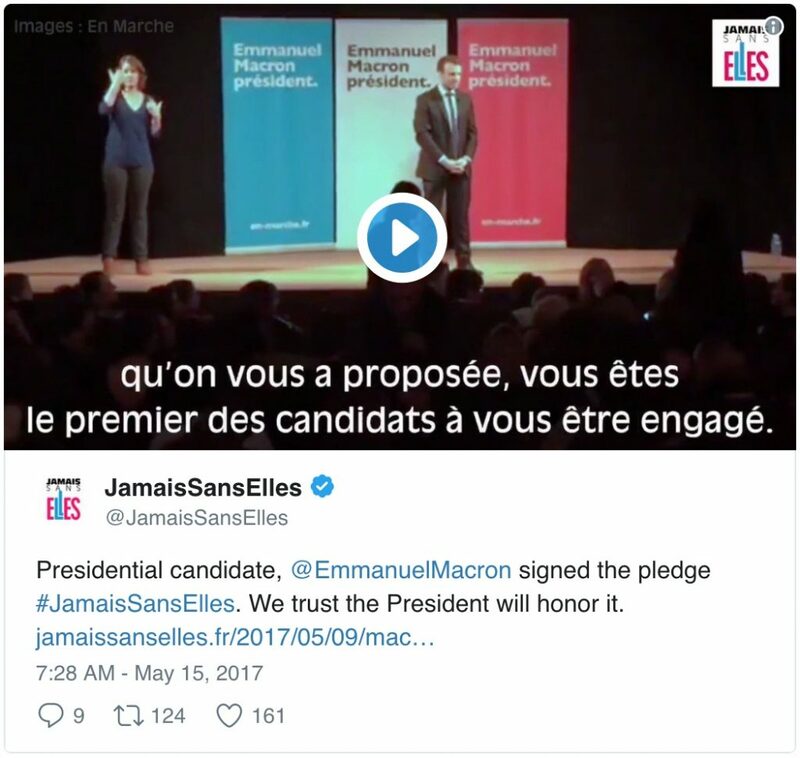 At the beginning of December 2016, the presidential candidate Emmanuel Macron declared “I am a feminist” and decided to sign the Appeal #JamaisSansElles. In the movement his personal commitment generated considerable activity: from December 3 to 6, 2016. The tweet announcing his signature was retweeted more than 700 times, liked more than 1200 times, and counts among his most shared tweets of the entire campaign. It even appears in the program “En Marche!”. 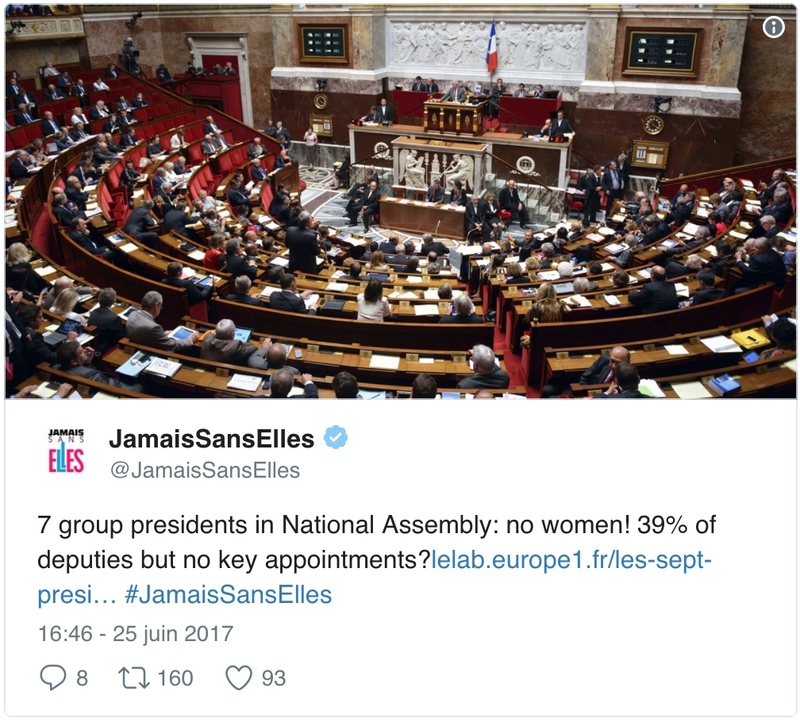 Shortly after the legislative elections, the political sequence of the election to the Presidency of the National Assembly and the various heads of parliamentary groups gave rise to many speakers referring to #JamaisSansElles. Would a woman be elected President of the NA for the first time? 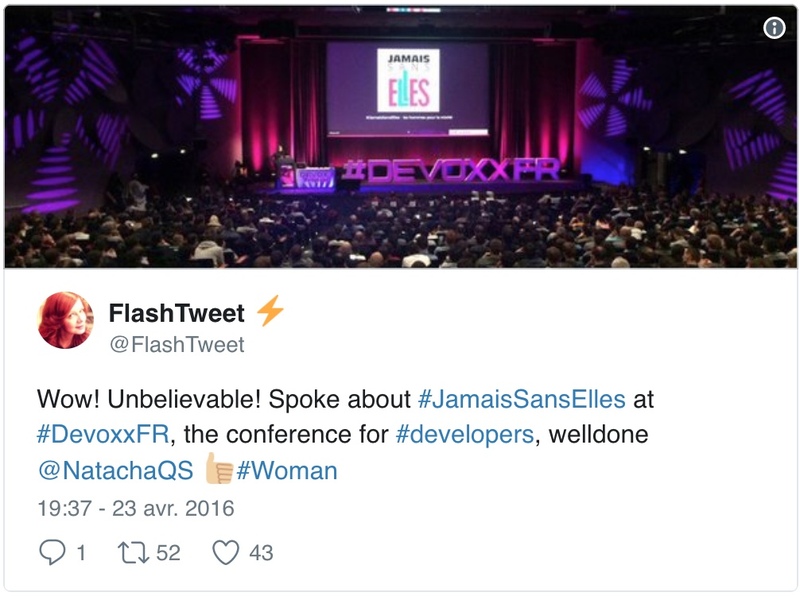 At the Palais des Congrès, with an audience of 2,600 developers, Natacha Quester-Séméon, spokesperson for the movement, presented a 20-minute keynote speech on women, digital technology and #JamaisSansElles. 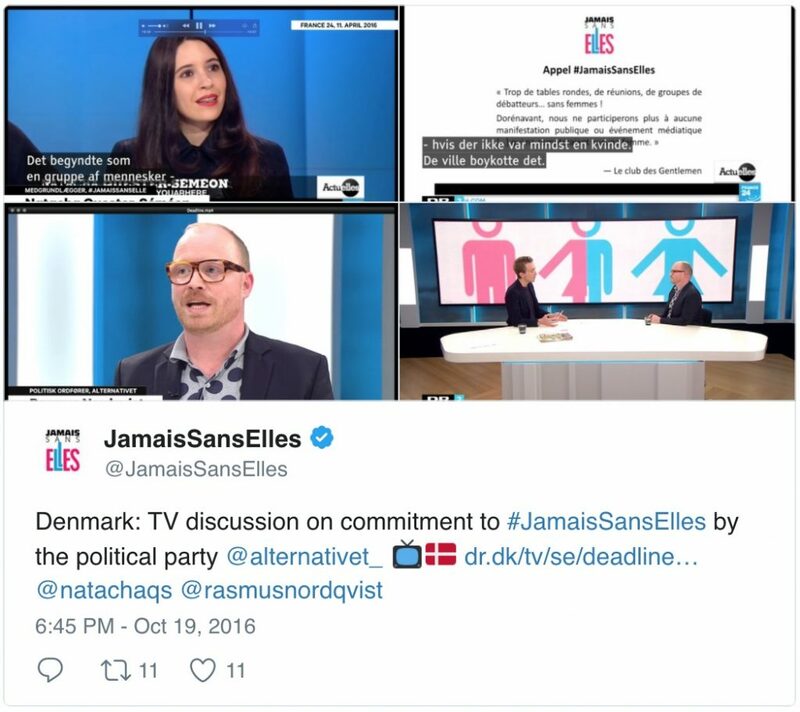 With a peak on November 18 for two main reasons: the commitment of the Alternativet party, appearances in the Danish media, and the publication of an article by Etienne Parizot in the Express on October 17. 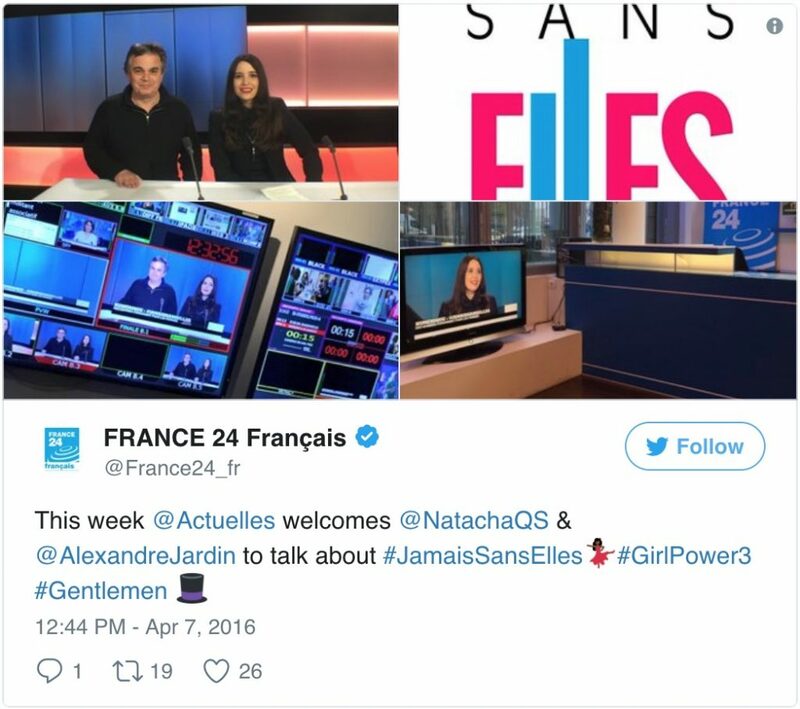 The appearance of Alexandre Jardin and Natacha Quester-Séméon on behalf of #JamaisSansElles on the program ActuElles of France 24 generated a peak of hashtag activity. Beyond the major events of the Association and the political sequences that have had a direct impact on the activity of #JamaisSansElles, the community involved has consistently maintained a very high level of commitment, demonstrating both its awareness of the various official appearances of #JamaisSansElles and its capacity to mobilize. * All data are from the measurement reference tool Hashtracking. The number of impressions indicates the number of times a tweet with the hashtag has been delivered on user timelines. The reach indicates the number of people potentially reached, that is, exposed to tweets that include the hashtag. It includes all of the followers of the accounts the tweets originated from at a time t.